Next week I will help present some Binghamton Neighborhood Project data to a small committee of people interested in the state of our city’s South Side. I will be showing maps of various demographic measures collected by the BNP, addressing the question “who are the residents of the South Side?” and demonstrating the project’s ability to develop knowledge about neighborhoods. 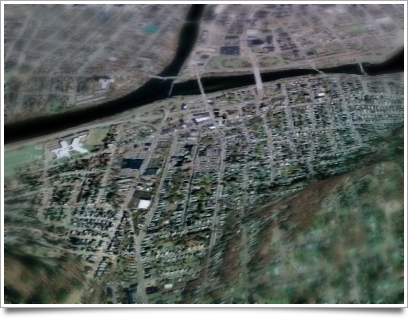 Binghamton's South Side as viewed from Google Earth. Today I have been thinking about how to present these maps. Spatially, the lowest common denominator for our data is the census block group. I will use census block groups as the enumeration unit for my thematic maps. However, in this case I don’t think it is sufficient to just plot the data. 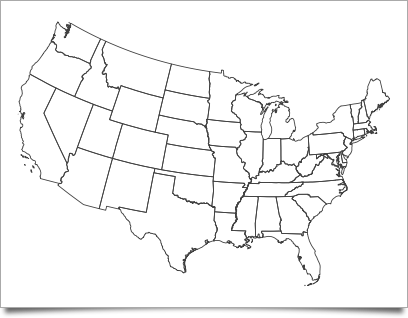 Few people are familiar with census geography – you may recognize the shape of your nation or state, but do you recognize the shape of your census tract or block group? U.S. states are easily recognized. If the purpose of a map is to complement the viewer’s knowledge of an area, it is the map’s function – and the cartographer’s responsibility – to link the data to the viewer’s conception of the place. If the enumeration units are easily recognized – states, counties, etc. – then no further context is needed. 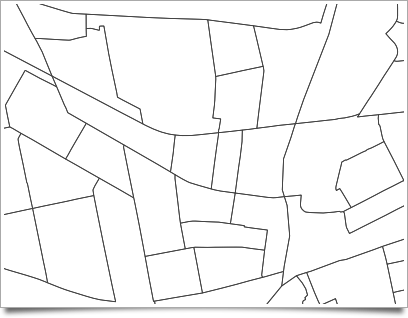 If the data is organized at an unfamiliar resolution, additional reference features are needed to root the map in the viewer’s world. Binghamton block groups are not so familiar, even to local residents. Reference features can be streets, labelled landmarks, or natural features. Boundaries of more familiar regions can be informative, too, but if the region of interest is small and falls entirely within well-known borders, physical features remain the best reference. Especially pertinent are those features people encounter in their daily activities. I think this sort of context has been absent in previous presentations of BNP data. The project has generated plenty of interest in the community, but little sustained engagement. I suspect the idea seems inspiring, but the information bewildering; it’s hard to act or base decisions on seemingly arbitrary patterns. Our goal is not to share what we know about block groups (or any other artifact of data collection), but to share what we know about neighborhoods – places associated with homes, schools, businesses, and the routes we navigate. So, I will try to make meaningful maps by integrating our information with some of these well-known elements. Posted on Wednesday, June 17th, 2009. Tags: geography.